When someone asks me how ghosts communicated before modern ghost hunting tools, I laugh. Ghosts can communicate without modern electrical devices. Sometimes, people are so focused on high-tech ghost hunting tools, they forget that ghost research flourished in the 19th century and earlier. – And, one of my favorites: Direct requests to ghosts. In other words, just ask them to respond in specific ways, like moving an object or making a sound. The problem is: non-electrical communications can be entertaining, but they’re not scientific evidence. Worse, they’re very easy to fake. The more high-tech the faking methods, the more difficult they are to detect. Most ghost hunters want more than easily debunked entertainment. Some want ghosts that perform reliably on command, and give 100% accurate responses to questions, 100% of the time. Even the living don’t do that. I’m not sure why we expect ghosts to. Others want full-body apparitions in photos they take themselves. We seem to be able to photograph orbs, and shadow people. 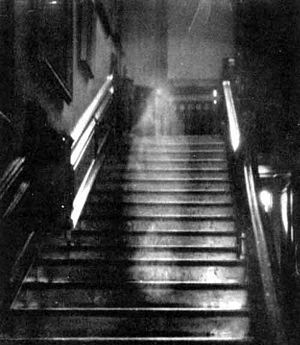 We rarely see apparitions, much less capture them on film. Some people want to hear ghostly voices on a recording. Convincing apparitions and crystal-clear EVP are so rare, they still impress me… when they’re credible, that is. Today, scientists and technicians are developing high tech, paranormal research tools. They’re designing ghost hunting devices that might produce consistent results under laboratory conditions. We’re getting closer, but it may be several years until we have ghost hunting tools that work consistently in haunted locations. However, for an entertaining — and often convincing — display of ghostly activity, old-school methods can be a fine choice. If it’s your research — meaning that you’re in full control — low-tech ghost hunting tools can be excellent. Perhaps even better than electronic ghost hunting devices. If that’s what you’re looking for, follow the careers of two ghost hunters. One is Brian Cano, who appeared on the “Haunted Collector” TV series. He’s familiar with many old-school ghost hunting tools & methods. The other is researcher Sean Paradis. He’s been exploring very low-tech ghost investigation tools. Author Fiona BroomePosted on 6 November 16 22 September 17 Categories Ghost HuntingTags Ghost Hunting EquipmentLeave a comment on What did ghosts do before electrical ghost hunting tools? In ghost hunting, pendulums are divinatory tools. Ghost hunting pendulums are usually made with a weighted object suspended from the medium’s hand by way of a chain, ribbon, or string. 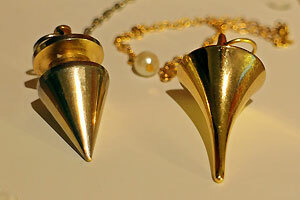 They’re simple, everyday pendulums, used by some ghost hunters. It’s just a moderately heavy object on a chain, ribbon, or string. You’ll hold the pendulum in one hand, suspended by whatever is attached to it, so the weight can swing freely in response to questions. In real life, I’ve also bought ghost hunting pendulums in Salem (MA, USA) from “witch-y” shops like Hex and from shops on Pickering Wharf, including Artemisia Botanicals, Laurie Cabot’s shop (now online), and NuAeon. If the subject of witchcraft — which (in non-religious terms) I believe is firmly rooted in quantum resonance — bothers you, don’t shop at a witch-related shop. Not for any reason. You must feel 100% comfortable with the ghost hunting tools you use. In dangerous settings, even the slightest waver can open a channel you may not have intended. You can make your own ghost hunting pendulum, easily. A ribbon and a ring or even a metal washer can work fine. Generally, the ribbon (or chain, or string) should be around eight or ten inches long, or longer. That’s one way to see if you are adept with a pendulum, and if you like using it. In the right person’s hands, pendulums can answer simple yes or no questions. Also, some investigators use them to determine the direction to move in, the same as others use dowsing rods to point the way. Several remote dowsers use pendulums over maps. Some people use pendulums with with special charts. I’ve tried them, and I wasn’t very impressed. However, you may have better results. Some charts strongly resemble the symbols and alphabet — plus yes and no — on a Ouija board. You can create your own charts, too. All you need is a pen and a normal sheet of paper. On it, mark years, numbers, words, colors, or compass directions. Really, there’s no limit to to the kind of charts you can design for use with a pendulum. Divinatory tools are not for everyone. Always direct the spiritual energy to the tool, not to or through your hand. Prayer or shielding is a good idea, before you being your work. In the field, I’ve tested pendulums with people who claimed no psychic gifts. My own pendulum research results have been okay, but not impressive enough to rely on pendulums for my ghost hunting research. However, I’ve seen pendulums work really well for others. For example, Lesley Marden’s results are impressive. Remember, this is a controversial topic. No two researchers will answer this question the same way. Consider all opinions carefully before using divinatory tools of any kind. Ghost hunting pendulums can work, but — from what I’ve seen — only a small percent of researchers use them, and results vary widely. Author Fiona BroomePosted on 2 November 16 22 September 17 Categories Ghost HuntingTags Ghost Hunting EquipmentLeave a comment on How do people use pendulums in ghost hunting? In the right hands, dowsing rods can be useful ghost hunting tools. First, you’ll use them to detect normal phenomena that can make a site seem haunted. For example, dowsing rods can detect underground springs and streams. Underground water can contribute to infrasound. Its low-level frequency disorients some people. They might think they’ve encountered a ghost when they haven’t. Some ghost hunters use dowsing rods to identify active areas at a haunted site. For that, you may need skill and sensitivity. You can learn the skill. I’m not sure everyone can develop the necessary sensitivity. Dowsing rods can respond to yes-or-no questions, as well. Some people use just one rod. I use two, and hold one in each hand. Hold the rods with a light grip. It should be loose enough so the rods can move without much resistance. Initially, hold the rods so they are parallel to the floor or ground. Then, tilt your hands so the tips of the rods are at a slight downward angle… less than a 10-degree drop. This allows gravity a gentle influence on the rods. If the rods are able to swing wildly, they’re useless. However, don’t let the rods point too far downward, or gravity will pin them in place. Ideally, the rods move slightly against the pull of gravity. Begin with some test questions. I start by asking basic questions I can answer myself, such as, “Is my name Fiona Broome?” The movement of the rods tells me what the rods will do for a “yes” answer, if anything. The rods may swing in opposite directions. They might swing towards each other and cross. They might point to the right or to the left. I try enough yes/no questions to detect a pattern. In most cases, both rods point in the direction of the coin. When I get there, they either return to resting position, or — more often — they’ll cross in front of me as if to prevent me from walking ahead. After that, I’m ready to use them on that investigation. I know how to detect a yes, a no, and how to tell where the rods are leading me. During the investigation, I might use them for yes/no answers. For example: “Is this ghost female?” “Is this ghost male?” “Is the ghost a child?” “Did this ghost live in the 17th century?” “… the 18th century?” “… the 19th century?” And so on. Note: Never start by asking when the ghost “died.” Many ghosts seem to reject the idea that they’re dead. If the rods indicate a “hot spot,” I usually walk around, testing different directions. Dowsing rods can detect underground water, water pipes, and electrical wiring. So, I see if the rods indicate (or point to) a long, straight line. If they do, I know the reading isn’t paranormal. I’ll check that same line with an EMF meter. I’m looking for normal (but elevated) EMF levels. If I find it, I’ll avoid that area as I continue my research. If just one spot or a small area seems active, I set up my ghost hunting equipment. I’m looking for anomalous readings and responses. You can ask dowsing rods to lead you to the “hot” areas of a haunt. There, you can use the rods, seance style, to ask — and receive answers to — questions about the ghost. However, dowsing rods don’t work for everyone. So far, we don’t know why. If dowsing rods work, but not as well as you’d like, you may need more practice. Place small objects around your living room. Then, ask the rods to lead you to a particular object. The more often you do this, the more skill you’ll have with dowsing rods, and the more confidence, too. Warning: Do not expect ghostly energy to work “through” you. Maintain firm boundaries. The ghostly energy works with the tools. You’re just propping them at the correct angle. Never give a spirit permission to enter or use your body to communicate. That may seem like a fine point, but with increasing dangers in ghost hunting, precautions are important. 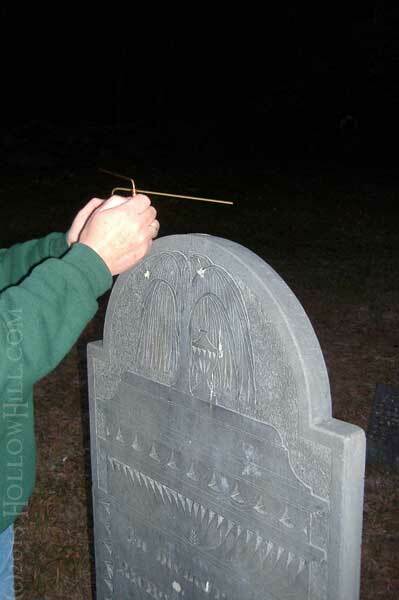 Here’s an informal, 10-minute video that explains how to use dowsing rods for ghost hunting. Some companies – including Joey Korn at www.Dowsers.com – manufacture powerful dowsing rods designed for ghost hunting. I’ve also used Joey’s recommended portable (collapsible) rods with great results. However, in my field tests, others had weaker (or no) results with smaller rods. So, start large. Over time, work down, if the big rods become too sensitive (swing too wildly) for your research. Or, make your own dowsing rods. You don’t need to buy dowsing rods. Make your own from wire coat hangers. Visit HollowHill.com for step-by-step instructions. If you want to use a casing for handles, visit a DIY store (like Lowe’s or Home Depot). Ask them to cut two small lengths of narrow, straight PVC pipe or brass piping. You’ll slide your dowsing rod handles (the shorter sides of the bent coat hangers) into them. Then, your hands can’t influence the rods at all. In my opinion, the more active my dowsing rods, the more active the haunting. If the rods barely move, not much is going on. If they respond vigorously, I’ll usually see EMF spikes, orbs in photos, and other phenomena. In rare cases, my smallest dowsing rods have swung in complete circles, repeatedly. (It can look silly, like a tiny helicopter blade.) I’m pretty sure those were active, paranormal spots. – Cambridge (MA, USA): At the mass grave of Revolutionary soldiers, buried under a mound in the Old Burial Ground at Harvard Square. – Methuen (MA, USA): Upstairs at Tenney Gate House, in one of the front rooms. Repeated several times before the anomaly ceased. – Salem (MA): In the basement of 127 Essex Street. (The basement isn’t open to the public. But, excellent ghost tours leave from in front of that shop). – Stratford-upon-Avon (England): One room in the Falcon Hotel, but only briefly. Several times at the Falstaff’s Experience (Tudor World), 40 Sheep Street. – York (England): The Golden Fleece Pub, but only a few times, in odd spots near the entrance. Did not repeat during additional visits. 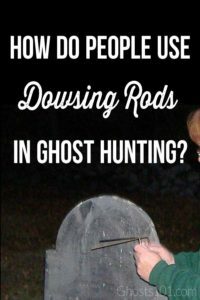 Author Fiona BroomePosted on 30 October 16 10 December 18 Categories Ghost HuntingTags Divination, Ghost Hunting Equipment6 Comments on How do people use dowsing rods in ghost hunting?